The debate about the cockpit protection concept ’Halo’ continues to rage at Hockenheim. GPDA president Alex Wurz is furious that the teams voted to delay it until 2018, arguing that all the drivers signed a document unanimously supporting an immediate debut. "I didn’t sign anything," Nico Hulkenberg told Germany’s Auto Motor und Sport. "Our drivers didn’t either," agreed Red Bull’s Dr Helmut Marko. There are yet more drivers opposing it. Palmer comes to mind. Next race 3 weeks away! Haryanto out, as expected. Ocon or Vandoorne in? Jarnooo a écrit: Haryanto out, as expected. Ocon or Vandoorne in? Finally! That "Haryonto could lose his seat"-story had been running for several months with nothing happening. Became sort of silly. Looks like Manor is quickly becoming for Mercedes what Toro Rosso is for Red Bull. Uh-oh they pissed off the government! It's a little strange - if it's that important to them - that they couldn't find a sponsor from the private sector to finance the remaining races. The parliament backs Rio? Good to know! Asked if the cars will also look more ’aggressive’, Force India’s Andy Green answered: "Definitely. "They’ll remind you of the cars from the 80s and 90s. It’s a good step — I like these cars," he told Germany’s Auto Motor und Sport. Green also said the 2017 cars will be much faster than the current ones. "Early in the season the increase in downforce will be 20 to 25 per cent, but by the end it will be even more — I’m guessing 30 to 35pc. It’s the biggest step I’ve ever experienced," he said. However, the bigger cars and tyres will mean more drag, which Green says will translate to a 20kph drop on the straights. But he said the laptimes at a track like the Hungaroring will be slashed by 3 to 4 seconds, as cornering speeds and braking distances become more impressive. I hope they got it right this time, and don't change things middle of season again! Gary a écrit: I hope they got it right this time, and don't change things middle of season again! What, new cars and tires mid-season? My only concern is what happens to overtaking with these cars. It seems there are conflicting views about it, which suggests that no one really knows at this point. real world situation before deciding? clueless, knee-jerk reacting, noses in the trough, life of luxury bosses!! I just read the original interview at Auto Motor Sport (German publication). He also got asked there about overtaking, and his answer is he can't really tell because most of it depends on how much grip the tyres will give them. So I guess it's not really possible to simulate all this stuff accurately because there are too many unknown factors at this point. In a sense that's exciting! You'd think that with Red Bulls aerodynamic expertise and Mercedes engine advantage, Red Bull and Mercedes will be the teams to watch. I wouldn't mind Red Bull having a slightly faster car, but Lewis making up for that with his driving! Accidentally stumbled upon the MotoGP race... incredibly boring stuff from my perspective. Yes, me too.... and yes, very boring!! I beg to differ! Plenty of really good action, especially in the opening laps. Didn't know which team would win until the last 8 laps, didn't know which driver would until the last lap. Not to mention Moto2, and Moto3 especially where the riders come across the finish line three wide on the last lap more often than not. Good stuff if you ask me. Don't know who your were going for but I was hoping Dovi would take the win! Jarnooo a écrit: I beg to differ! Plenty of really good action, especially in the opening laps. Didn't know which team would win until the last 8 laps, didn't know which driver would until the last lap. I tuned in with 19 laps remaining or something, and I don't remember having to guess which team would win. Wasn't clear then which of the two teammates would win, but I didn't see anything I'd call "action" while I watched. Perhaps Ducati was a little further ahead, but not like the gap everyone was expecting. Either way not boring by any means. Great news to see Ocon in F1. Remember he beat Max Verstappen in his F3 days. I think he could shine in Manor as Jules Bianchi did (exactly, like Jules did in Monaco '14). The battle of the Mercedes Rookies! Will be interesting to see new driver yes. Ocon seems to be in a great position with both Renault and Mercedes backing, and Renault seemingly not too thrilled about their current drivers (at least that's how I interpreted their earlier comments). Bottas stays with Williams. Not a big surprise. Who else would want him? He's certainly not that charismatic driver Renault are looking for, and where else would he go? You'd have thought he would be at home practicing a different kind of fast start? 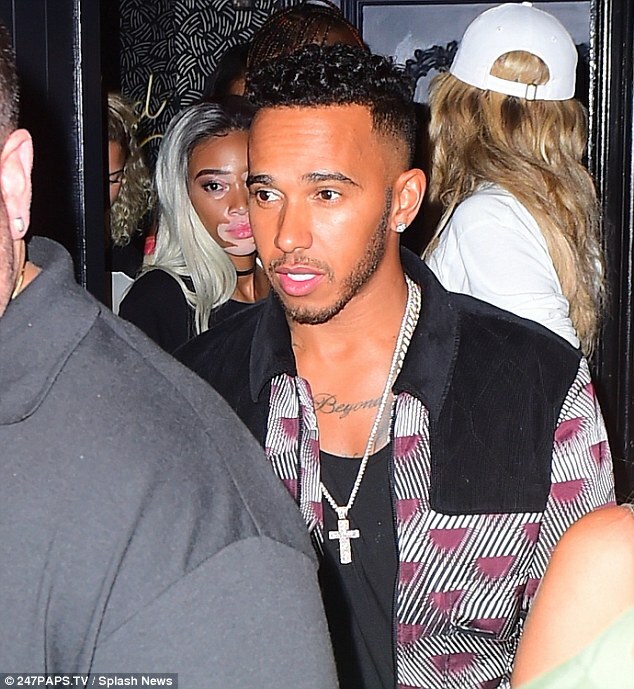 Lewis Hamilton partied into the early hours with rumoured girlfriend Winnie Harlow on Wednesday evening following claims they have been dating in secret for three months. The pair partied up a storm at New York’s Up and Down nightclub after arriving separately in the early hours of the morning.